Petting Donald Trump’s hair was probably not the best idea, Jimmy Fallon is ready to admit. The Tonight Show host sat down with the New York Times to talk over his ratings drop and the fallout from the Trump interview that found the late-night host tickling the president’s scalp and asking him a set of goofy, softball questions. “I didn’t do it to humanize him,” Fallon told the Times. “I almost did it to minimize him. I didn’t think that would be a compliment: ‘He did the thing that we all wanted to do.’” That’s not the read many viewers had on the moment, though. 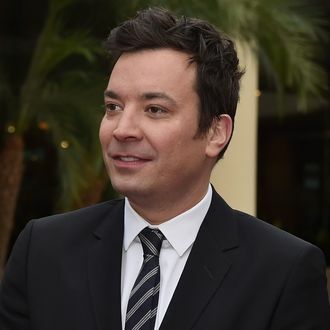 Critics blasted Fallon for going easy on the then-presidential candidate, who at the time had recently refused to say if he believed President Barack Obama was born in the U.S. The fallout from the segment was tough on Fallon, who admits he’s a people pleaser. For Mr. Fallon, who lives a portion of every day online, the hate felt inescapable. Speaking in a quiet, tentative tone, Mr. Fallon seemed to be reliving the experience as he recounted it.